I've been a traveling girl for several weeks now, and this past weekend I was home for the first time in over a month and craving my kitchen. When I think about blogging, I'll usually pick a single dish over the weekend to cook, re-cook, refine, taste and shoot. Sometimes I'll have a back-up recipe if Plan A falls apart, but I never tackle three new dishes on the same day, because that would just be ... insane. I guess I was really missing the stove because this past Sunday, I tackled three techniques/recipes I've either a) struggled with unsuccessfully my entire culinary career or b) been to afraid to try. They were, in this order, poached eggs (my white whale! ), buckwheat crepes and a seafood paella. If anything, it was a recipe (sorry!) for disaster. I was fooling myself that even one of these endeavors would work out, that I would blog about my failure and everyone would see me for the fraud I truly am, I would be kicked out of the village and promptly be eaten by saber-toothed tigers. Goodbye, cruel world! I'm pleased (and perhaps surprised) to report that none of that happened. Everything turned out perfectly. I realized, most importantly, that even if it hadn't, even if Michael Rhulman's cannot-fail technique did not produce perfectly poached eggs, if my crepes had cracked and if my paella had produced puddles of inedible food, I would not be a fraud, I would not be kicked out the village, and saber-toothed tigers went extinct a long time ago. I have been at this cooking and writing about my cooking thing for awhile now, and if there's one take-away I can offer to anyone out there who may be struggling with their cooking, it's this: you will get better. Keep at it. If a recipe doesn't work the first time, try it again. If it still doesn't work, substitute and supplement ingredients that do work and make it your own. Sometimes recipes just don't work and they'll make it into a cookbook anyway. While we wish we could hunt those cookbook editors down and spoon-feed them cold oatmeal, we can simply agree that sometimes recipes just don't work and move on to find the one that will. My success this past Sunday was payback for all the times I cooked something and it just didn't pan out. You'll know you're coming into your own as a cook when the successes come more often than the failures, and when the failures do come, you don't take them so personally. It's just food, after all. 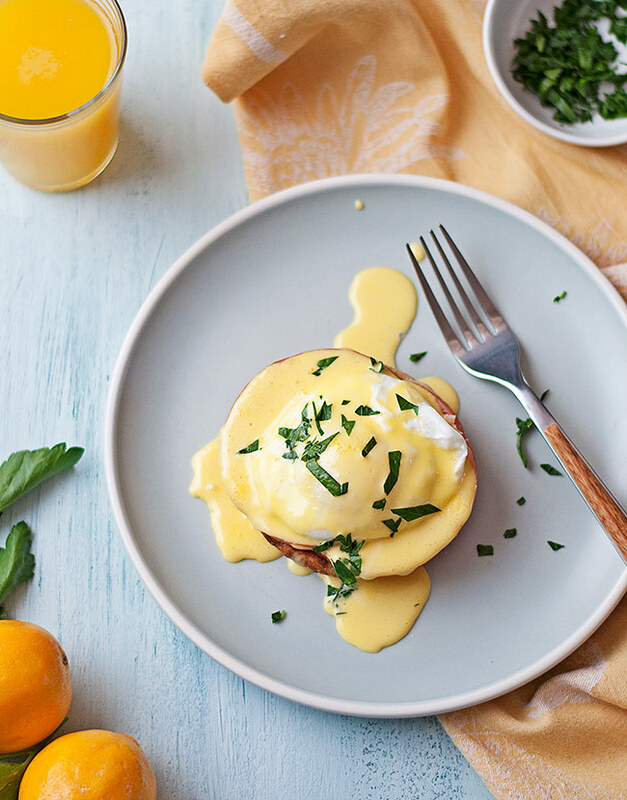 So below is a recipe for a simple Eggs Benedict but for me, it's like I've tackled Mount Everest and am sliding down the other side, whooping it up. Two things I (and maybe you) never thought I could master; poaching eggs and making hollandaise, were no longer so formidable to me. So much so that I could make this every day and be happy, but then where is the challenge in that? I conquered a culinary fear and now I'm ready to push myself into that unknown territory once again. Perhaps I could have waited a day or two before tackling the crepes and the paella (coming soon to the blog), but I was riding a contact high, folks, and it felt good. Alright! So poaching eggs technically isn't that difficult, and yet I couldn't seem to produce an egg that was perfectly shaped without the scraggly fly-away edges. Sure, I could trim those with kitchen shears, but I had so many white fringes that after trimming, I barely had any white surrounding my yolks! And if you've ever researched poaching eggs, you know there are a million different variations out there. I'm pretty sure I tried them all. I even found a technique that was quite close to Michael Ruhlman's method which is what I'm sharing here today, but I was still unsuccessful. It took repeated attempts and lots of research until I finally stumbled upon a rather simplistic approach with the least amount of fuss. I first discovered Michael Ruhlman when I was looking for ways to refine my cooking skills. I was cooking a lot of recipes once because there were so many cuisines I had little experience with and wanted to try, but I felt like my cooking wasn't getting better. I wasn't getting strong technique nailed down solid because I was continually trying something new all the time. Great for expanding your palate, but not so great if you're trying to be a better cook and hone your skills in the kitchen. I began gravitating toward chefs who focused on honing their skills so that even the most basic dishes were plates full of flavor bombs. I snatched up Thomas Keller's Ad Hoc At Home which I highly recommend to anyone who wants to learn to cook better. He introduced me to brining and now I can't imagine roasting or frying a bird without brining it first. Wanting to keep that refinement at the fore-front of my mind, I acquired Michael Ruhlman's Twenty: 20 Techniques, 100 Recipes A Cook's Manifesto which is another must if you want to get serious about your cooking skills. And that finally led me to Ruhlman's latest book, Egg: A Culinary Exploration of the World's Most Versatile Ingredient. What Ruhlman points out, and what I'd also discovered doing research on a similar technique, is that an egg is made up of not just two proteins that coagulate at different cooking temperatures - the white and the yellow - but that there were actually three parts; the yolk, and two parts of the white. One part of the white, obviously the most noticeable, is a thicker, more cohesive white, and the other part is a looser white. That looser white is what almost always separates from the thicker white, creating those damnable wisps of egg white that inevitably separate from the egg and cloud up the water. In an attempt to lessen that effect, most recipes call for adding a tablespoon of vinegar to the water before adding the eggs. Well, Ruhlman forbids it, and so I, too, request that you do not do this. You don't need to do this! The trick that Michael learned from Harold McGee's invaluable book On food and Cooking, is to let that loose, runny white separate from the "stiffer" white by draining the egg in his special "Baddass Perforated Egg Spoon" - yes, that's what he calls it, yes he actually sells it, and yes - I gots myself one for my birthday! You could use any slotted spoon for this, but Ruhlman's spoon has an extra-deep bowl which insures that large eggs won't over-run it. A previous technique I uncovered recommended using a fine-mesh strainer to drain the loose white off the egg, then slowly submerging the strainer into the pot and shaking it gently until the egg came loose to float away freely into the pot of simmering water. That totally did not work. My egg stuck the strainer. The metal spoon with it's large holes did a great job of draining away the unwanted white and the remaining proteins slid easily into the pot. This worked for me on my first try and it has worked for me on every try since. An additional key point is that you don't want your water boiling - another road block to keeping the contents of the egg tight together. Bring your water to a simmer, then turn it to the lowest heat setting, or even off the heat altogether. Detailed instructions are below. Finally, I scored some Meyer lemons on my trip to Flagstaff last weekend, so I used them to make Ruhlman's so-easy-it-hurts Blender Hollandaise. Regular lemons are completely fine here - I just love Meyers and when I get them, I take advantage of them. Are you ready? Let's get to it, then! 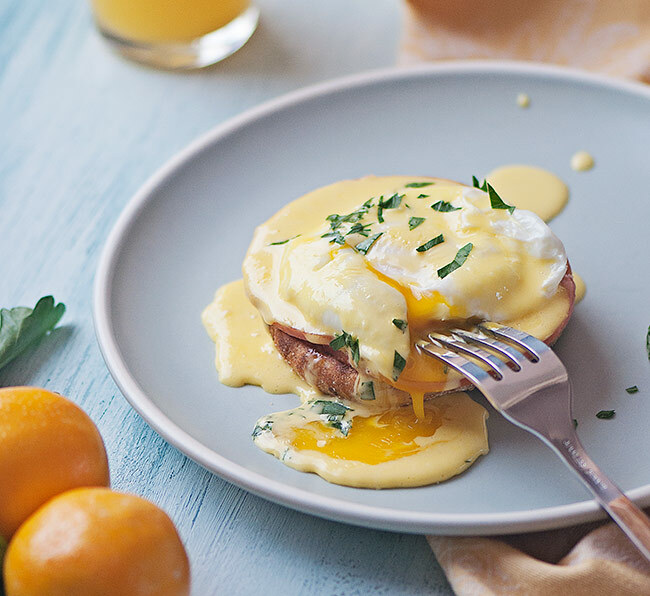 I like to make my hollandaise sauce first, then keep it covered and warm while I poach the eggs. Pour the lemon juice, salt, and yolks into a blender. Turn the blender to medium-high, then pour the hot butter in a steady stream into the blender until all the butter is added and the sauce is thick. Remove to a bowl and cover to keep warm. If the sauce gets to thick while it's waiting on you to poach the eggs, you can warm it gently over low heat. As many eggs as you'd like to make - I like bringing my eggs to room temperature before poaching them. While your water is heating, crack an egg into a small bowl. Over a second small bowl, pour the egg into a deep, slotted spoon to drain off the loose white. Bring the pot of water to a simmer (not a boil), then reduce the flame to low or remove the pot from the burner completely. Give the water a stir to keep the egg from sticking to the bottom - stirring also helps make the eggs more shapely), and drop your drained egg from the slotted spoon into the gently swirling water. When the white has completely congealed, at least 90 seconds to 120 seconds, use your perforated spoon to lift the egg out of the water, swooshing the water underneath the egg if necessary to help you lift it off the bottom. If you see that the egg isn't quite done, just return it to the water until it is. Allow any excess water to drain off; you may need to tilt the egg so that any water collecting on the white can run off, or touch a paper towel to its surface. Serve over toasted English muffins and a good quality ham, then drizzle with your lemony hollandaise sauce and chopped fresh herbs if desired.